For a while I have been looking for a solution to limit the amount of hop and hot break material that may get trapped in my plate chiller. I use a Chill Wizard system, from Sabco, which integrates a pump, a plate chiller, inline oxygen stone and thermometer into a handy little stand. I have few complaints, but have experienced hops blocking up the plates, which can be messy to fix, and a real PITA on brew day. A hopback is a traditional tool that functions both to add hop aroma and flavor, while acting as a filter at knockout. I have looked at smaller systems, such as the Blichmann HopRocket, but it is pricey, and would require new connectors and such to integrate. It is also small, and for big hop flavor, I expect to use several ounces of whole leaf hops in the hopback. When I saw the one from Stout Tanks, and the great pricing, I pulled the trigger. The hopback is a heavy and solidly made. The inside is smooth with the two outer ports. 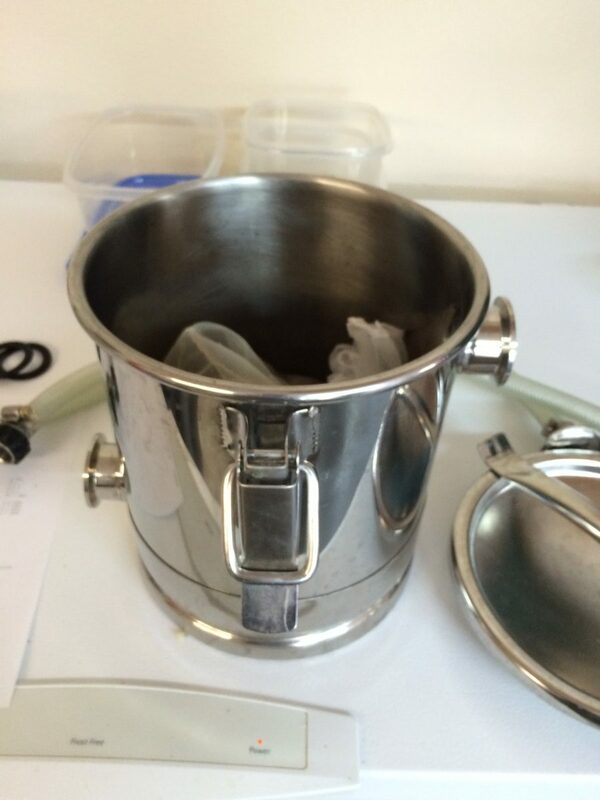 The lid seals airtight with a silicon gasket and the lid clamps you see in the photo. It also comes with the 1 1/2″ TC clamps, gaskets and 1 1/2 ” TC to 3/8″ hose barbs. You will need to thoroughly clean and passivate it before use. I decided to give this a test run, without really doing much research. I installed this on my kettle as a grant, letting boiling wort gravity feed into the hopback from the upper inlet, and drain to the Chill Wizard pump from the lower outlet. 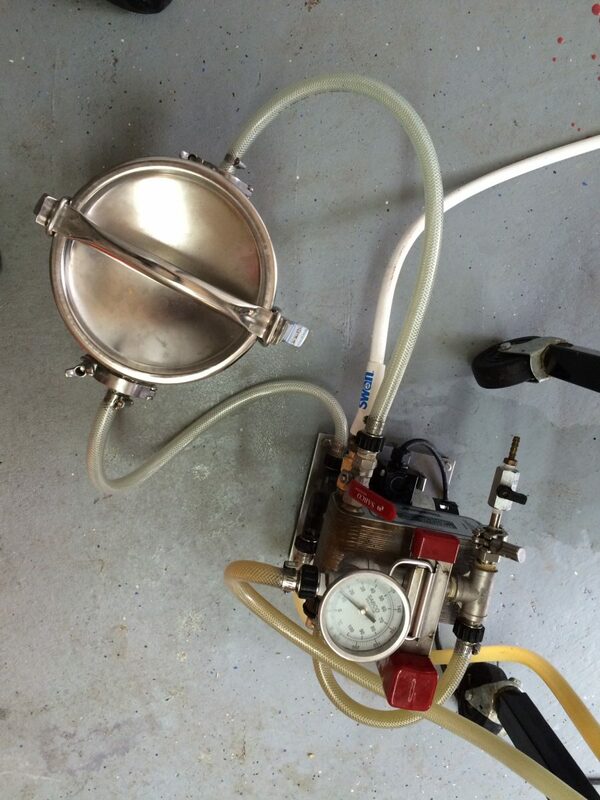 This worked – sort of – I constantly pulled wort too fast and emptied it. So the grant concept went out of the window. The air in the hopback also caused the pump to cavitate randomly so knockout went at a crawl. It was clear I need to modify the position of the hopback. As for the test batch, the saison was cast over about 2 ounces of whole Tettnang hops in a strainer bag (as recommended). I think there was a strong contribution to the aroma and flavor of the saison. From pump to the upper inlet, from the lower outlet to the plate chiller and valve. Test batch number two was based on my house APA recipe, with minor modifications to the grain bill (lighter color), and big changes to the hop schedule. 50% of the bittering went in as FWH, and the rest were a short 10 minute addition of 1 ounce each of Zythos and Calypso (pellets), and onto 4 total ounces of whole hop Columbus and Bravo. Yes, I got everything backward, but on purpose. I built a new set of hoses with the 1 1/2″ barbs to allow the hopback to sit between the pump and the plate chiller and valve. 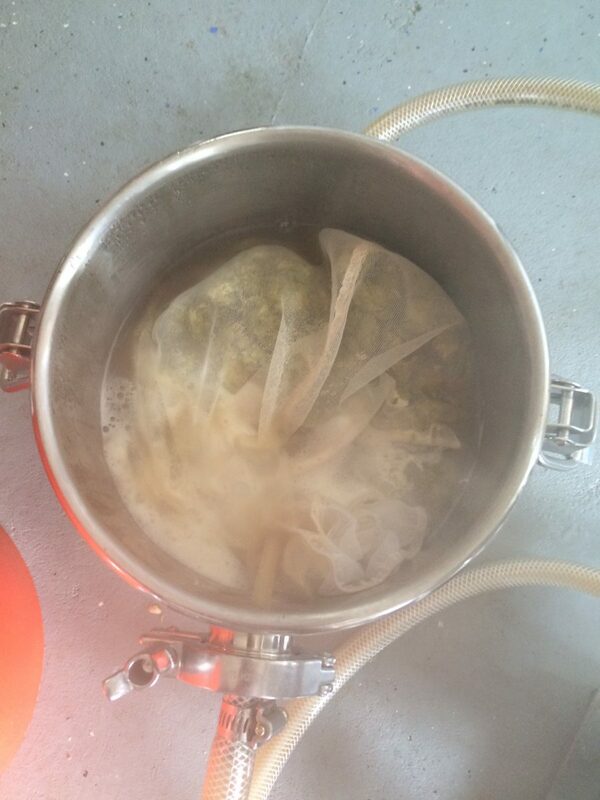 I then opened the hopback, with the hops in place, and allowed it to gravity fill with boiling wort. Once it was nearly full, I stopped the flow and carefully sealed the device. 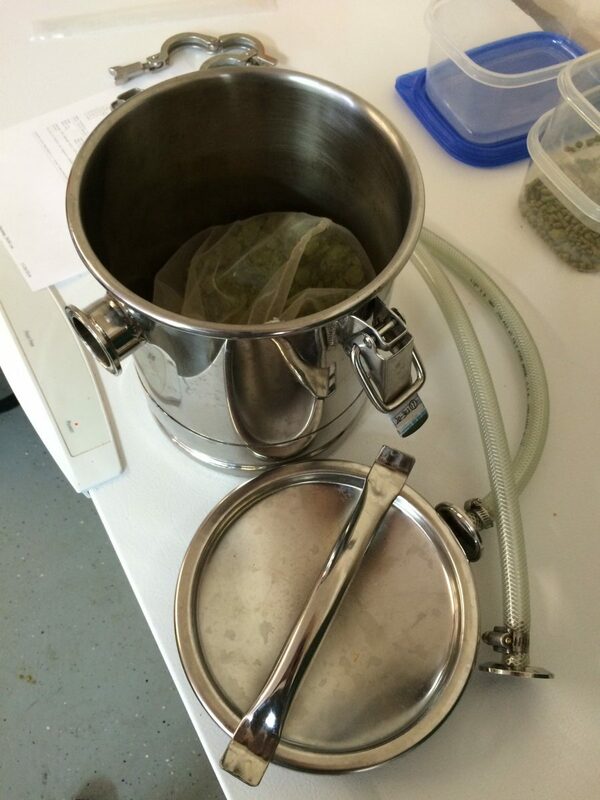 The configuration was from the kettle, through the pump, into the upper inlet, across the swollen bag of hops, out of the bottom outlet and into the valve and plate chiller. With the exception of a giant air burp back into the boil kettle (when I figured to open and fill the hopback) – this worked flawlessly. With the hopback sealed up tight, I am hoping that the wonderful oils and aromas from the hops will be carried through into the fermenter. Time will tell. 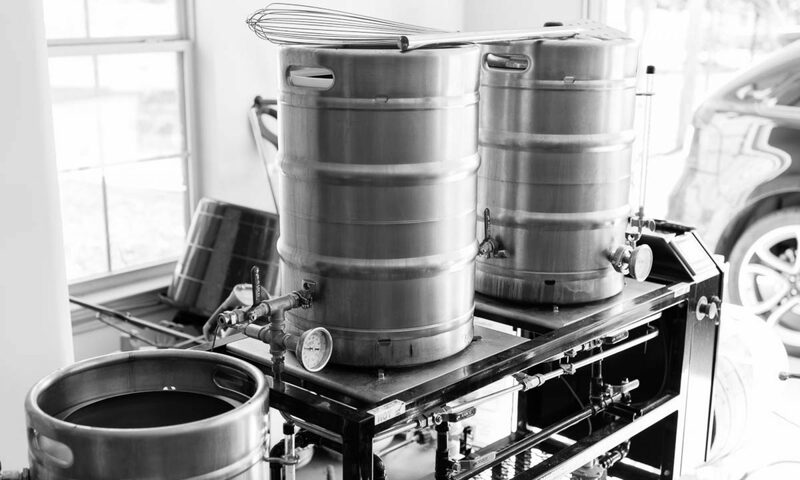 EDIT: After talking through this with a friend, it makes more sense that the wort flows into the bottom and out the top – this manages the air pressure more efficiently, even though the pump is in front of the hopback. Will make that adjustment next brew to see if there is any difference. The wort is amazingly bright. Of course, cold break still forms in the plate chiller and will make it into the fermenter. There seems to be no good way around this problem, and I am thinking about replacing the plate chiller with a convoluted counter-flow chiller, while still using the Chill Wizard stand. With the chilly weather we have had recently, I was able to knock out in less than 10 minutes and chill to about 70F. If this recipe (and I have strong doubts about the hop schedule) works out – I plan to brew a comparison batch with just a hop stand to compare. I might also rig something that allow me to split a batch to compare directly. While I typically bitter my APAs to around 60, I restrained this to around 45. I also adjusted my hop’s bittering AA based on age. I keep all of my hops in a freezer in vacuum bags – but some of the hops age poorly. I will need to measure to figure out the losses for the hopback. The hoses are a bit longer, and the 4 ounces of hops will soak up some wort. Also – I am sure there is a bit of wort left in the hopback. In Beersmith, I added these hops as whirlpool/stand with a 5 minute contribution – I suspect that will need to be shorter for a more accurate count. The IBU contribution is really likely minimal. Of course, once the device is sealed up – the aroma is trapped! So – will check back in when this beer is finished in a few weeks with some tasting notes. If it is good – will post the recipe! What size batch were you using this for, with the 4 oz of hops? It was a 11 gallon batch. I need to revisit this soon. Time for a few hoppy beers!